The loaves look really pro. The loaves look really pro. What kind of loaf tins do you use? 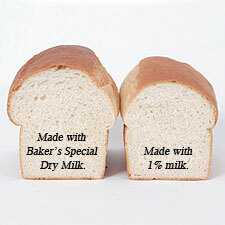 How do they compare to loaves made with non boiled milk? Actually, I think the milk is only supposed to be scalded. That is, heated to just before it boils. I believe the main benefit of scalding the milk is that it is supposed to make the loaf rise higher? Heating milk alters the milk proteins and improves their ability to bond more closely with oneanother. The longer its heated the greater the affect of strengthening the protein bonds. I was always under the impression that the scalding that was called for in recipes was started because of people using raw milk, which has enzymes that inhibit yeast gas production. Since milk purchased in stores has been pasturized, it didn't need to be heated, at all. I buy raw milk for consumption, so instead of heating it for making bread, generally use powdered milk, which works fine.